For opening night of The Book of Mormon, Mary and I, along with our hubbies and friend, went for a foodie dinner. 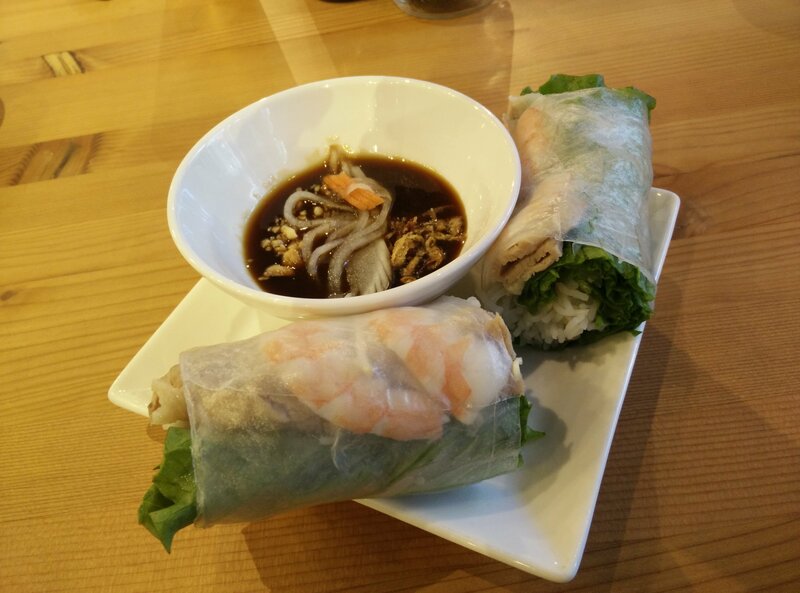 I’ve passed by Hai Phong Vietnamese Kitchen several times and now finally had a reason to dine there that evening! Hai Phong has two restaurants, one along Kingsway in East Vancouver, and this location, which is located at Keefer Place near Rogers Arena/Tinseltown area. Hai Phong Vietnamese Kitchen is quite small – there’s only one table that can sit up to 6 people, and a few tables for 2-4 people. Luckily when we arrived there wasn’t a wait to be seated. 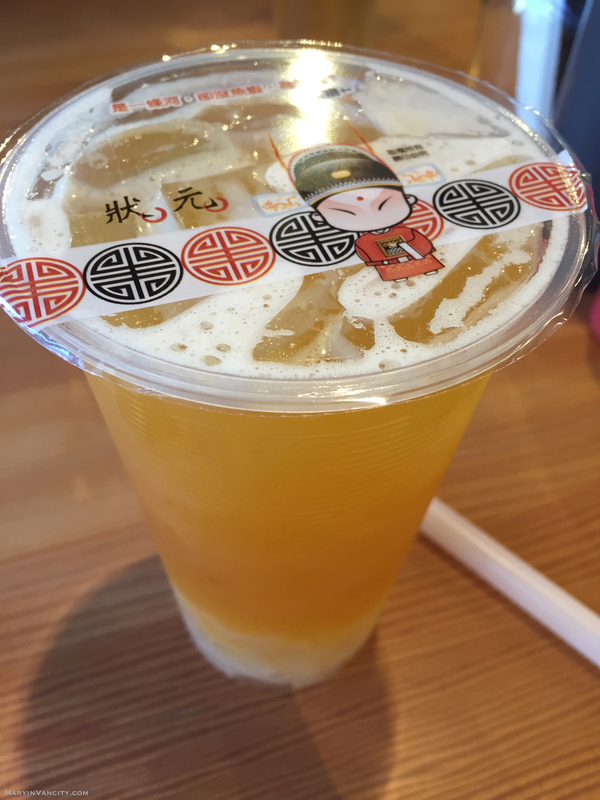 I was pleasantly happy to see that there was a wide variety of drinks offered, along with Vietnamese staples such as soup noodles, lemongrass chicken/vermicelli, and baguette subs. I was excited to order their beef stew, but was then told they didn’t have any french bread left to serve alongside it. Strike 1. I instead decided to order the Grilled Pork Skewer & Sugarcane Wrapped Shrimp Cake with Vermicelli, only then to be told they were out of shrimp cake. Strike 2. 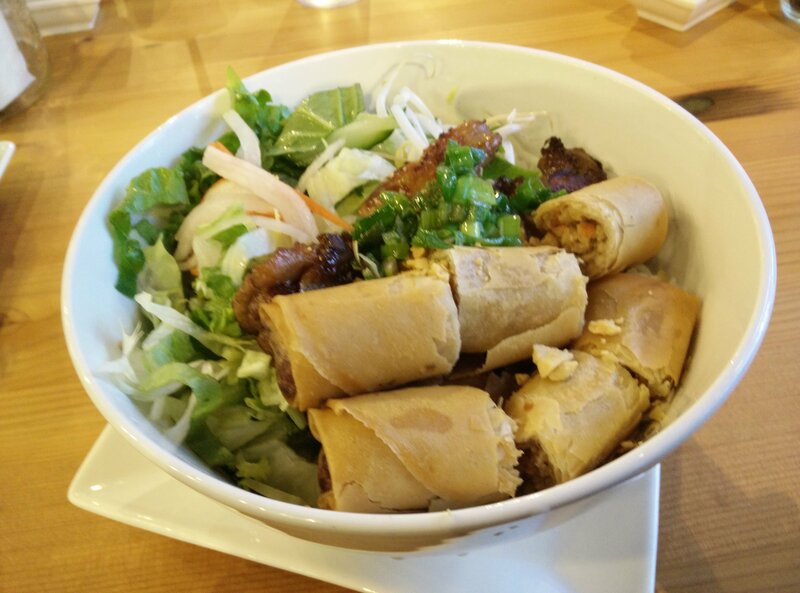 Luckily for me, they still had Grilled Lemongrass chicken with spring roll on vermicelli, so I ordered that instead with a side order of Shrimp & Pork Salad Roll. 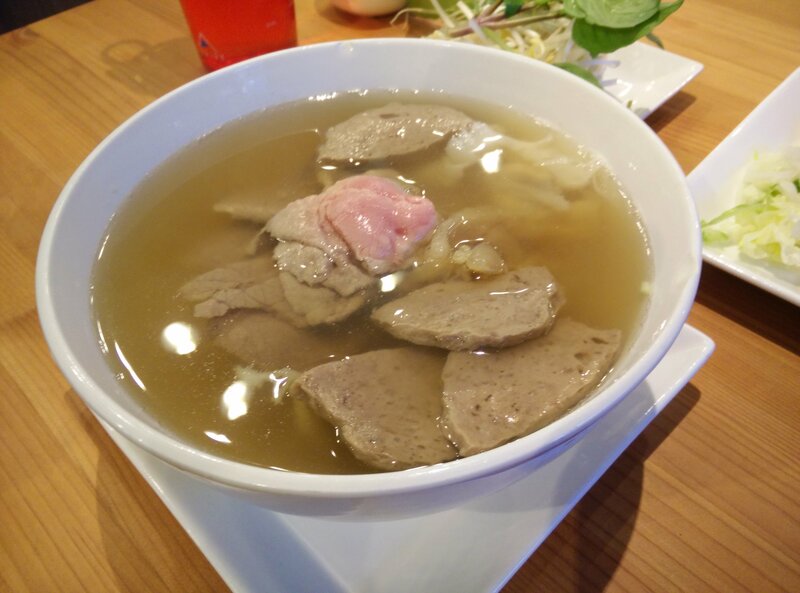 My hubby ordered a customized pho that included all meats listed – rare beef, beef balls, brisket, beef shoulder, tripe and tendon and a side order of Garlic Butter Chicken Wings. 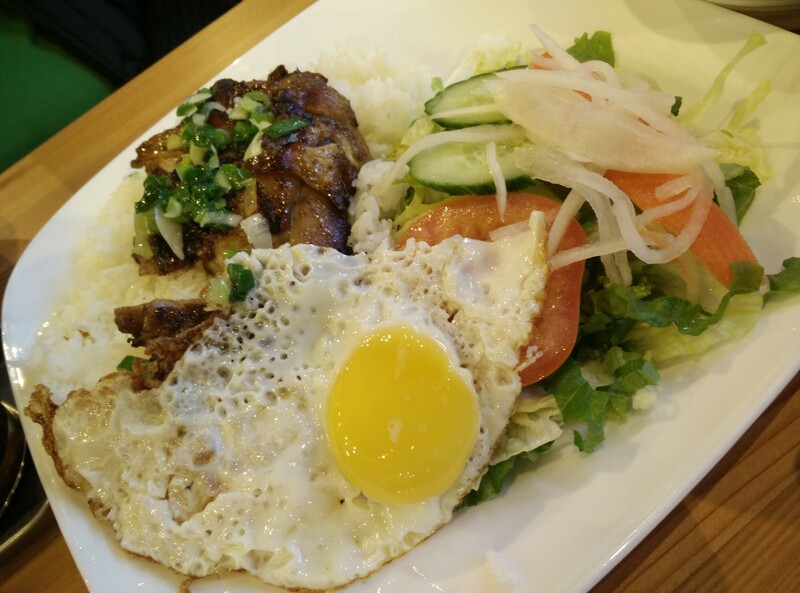 Mary ordered the Grilled Lemongrass chicken with a passionfruit bubble tea with lychee jelly, while her hubby ordered the Grilled Pork Chop with Fried Egg on Rice.Our other friend ordered a Shrimp & Pork Salad Roll and order of Spring Rolls. The orders came quickly and there was ample food for all of us! Based on the silence at the table when we started eating, it sounded like everyone enjoyed their dishes or was quite hungry! 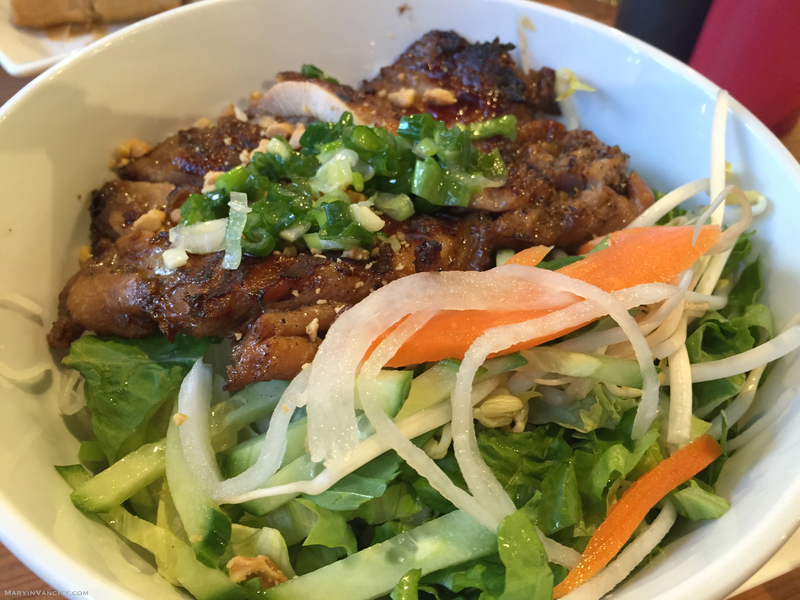 I really enjoyed the flavors of the lemongrass chicken, and for the price, it’s quite a deal for Vietnamese food in the downtown vicinity. I found the chicken wings to be on the spicy side, however the garlic butter dip was a good compliment to them. 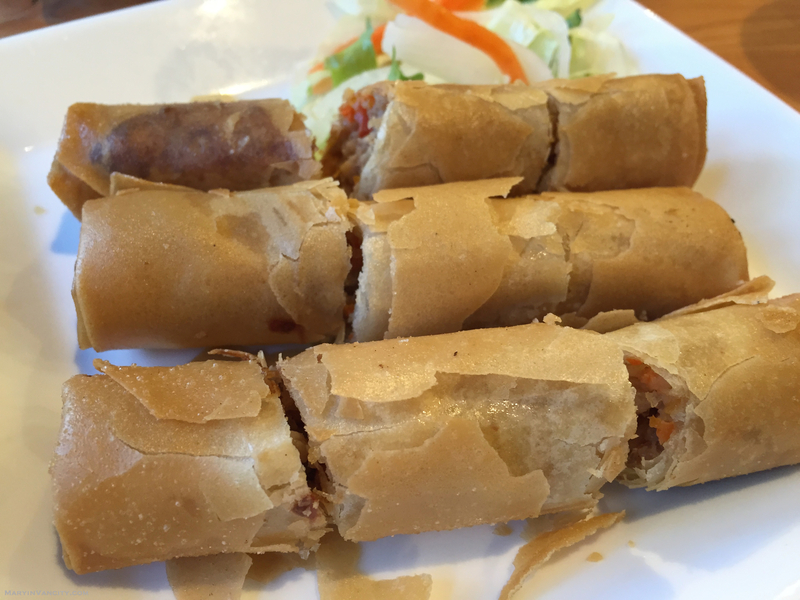 I wasn’t a fan of the dipping sauce for the salad roll – I would’ve preferred a bit more peanut sauce flavor instead of the hoisin sauce flavor. The spring roll was nice and crunchy, just how it’s suppose to be. On a side note though, I’m not sure if it’s the garlic or the MSG in the food, but I had an incredible parchness and salty flavor lingering in my mouth the rest of the evening after dinner. Might want to hold off on all the fish sauce next time when visiting since I had poured the whole bowl of fish sauce provided to me for my noodles. In summary, I’d come back again, however I hope they have their full menu to offer as I’d like to try their french bread and beef stew, as well as their Vietnamese subs. I actually got pretty inspired by this cuisine, should maybe plan to get visa for Vietnam to try the original one. 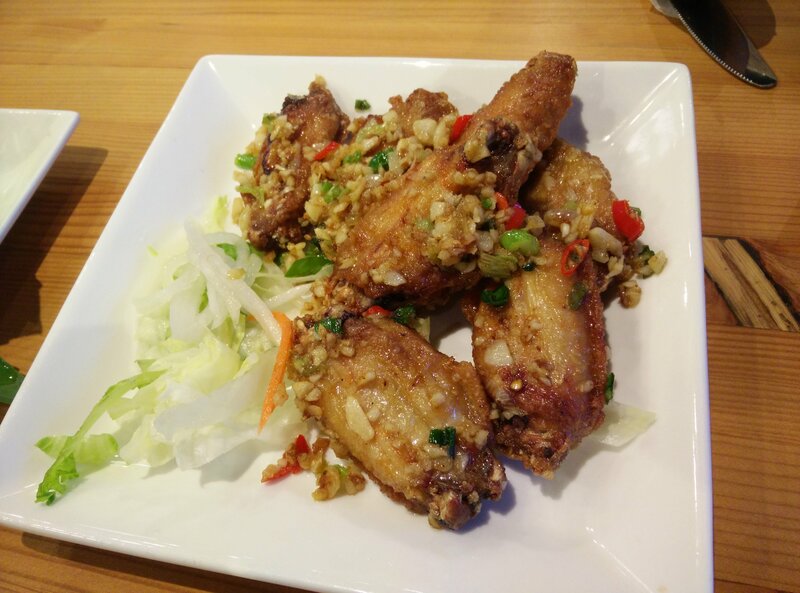 Here, if you’re looking for something sit down, filling, and Vietnamese before a hockey/football/Whitecaps game or heading to QE Theatre for a show, this is a quick place to grab a bite and not overly busy!